The following is a basic diagram for a 24 agent by 48 line, stand alone SpitFire Predictive Dialer. Stand alone meaning that the Dialer is not using any lines from an existing Phone System. The incoming lines are direct from the phone line Carrier and the Agent stations are using headsets that are connected directly to the Dialer's MSI station card. 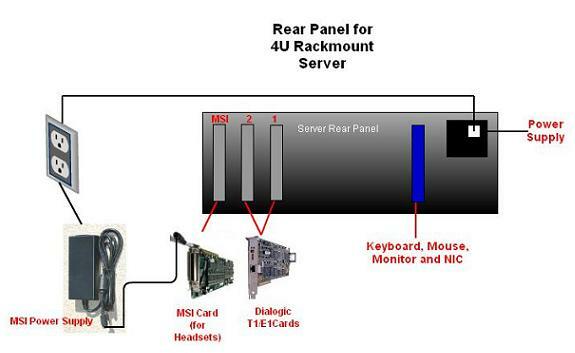 The next image is a diagram of the back of the 4U, Rack Mount Server to show the basic connection points for the T1/E1/PRI lines, MSI Station card and power supply, etc. In this example, there are two T1 cards and one, 24 port MSI card for the station headsets. The order of the cards will always start from the card closest to the keyboard, mouse and monitor connects. This T1 card is lines 1-24 on the Dialer. The card next to that one is the 2nd T1 card and would be lines 25-48. The MSI card for the stations will always be closest to the edge of the Server.